The Lyons River Run 5k kicks off Good Old Days with a bang! The course starts and ends in Sandstone Park, weaves racers through Bohn Park, a mid-corridor trail stretch along the St. Vrain River, and into a few local neighborhoods. Join the fun! Cash prizes will be awarded for the top three male and female finishers, and other prizes will be awarded for various categories! Register online before 2pm Friday for discounted pre-registration fees! Race day registration is $25 for all ages. Register online (until 2 pm June 23) or volunteer! Course map, registration, and all race information can be found at lyonscolorado.com. The Lyons Volunteers are a few of Lyons' unsung heroes - let's show them our gratitude! 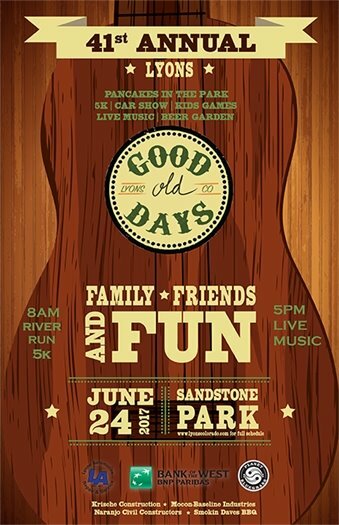 Thank the Lyons Volunteers in person, as they host this year's Good Old Days' Pancakes in the Park! Following the 2013 flood, a group of selfless individuals strapped up their boots and offered their help across the community, under the name of the Lyons Volunteers. Today, the Lyons Volunteers is a registered 501(c)3, and continue to offer their services throughout the community, two days a week. The Volunteers will be serving up pancakes, eggs, and sausage in Sandstone Park, from 8:30 to 10:30 a.m. on June 24 Thanks to the generous donation of food by Oskar Blues, all proceeds benefit Lyons Volunteers! A $5 donation per plate is suggested. Sound delicious?! Join the event's Facebook page! Join the Town of Lyons, Representative Jonathan Singer, Mayor Sullivan, and more for the official dedication of the LaVern M. Johnson Park, on Saturday June 24, beginning at 11 a.m.
Named after this dear, lifelong resident, who has been deeply involved in the town's parks nearly all her life, the dedication is part of the 41st Annual Lyons Good Old Days celebration. All are welcome to attend. The RTD parking lot and 4th Avenue, between Broadway and Railroad, will be closed Saturday, June 24, for the Good Old Days activities. Recently, Longmont United Hospital announced that it intends to close the Lyons medical clinic owned and operated by Centura Health Physician Group (CHPG). To help prevent this closing, or to develop another solution, the Board of Trustees is asking area residents for information about their healthcare needs. Please help in efforts to evaluate viable options, by filling out a survey as soon as possible. You do not need to create an account on the Town website to complete the survey. Any responses to this survey will be anonymous and confidential and will be used only to inform discussions about the future of the clinic. Thank you for helping us to understand our community’s healthcare needs by sharing your opinions. The Town of Lyons is proud to present the 2017 Goodwill Fund to support human services in the Town of Lyons and the surrounding area. The purpose of the Goodwill Fund is to assist nonprofit organizations that help low-income individuals and families in the Lyons area meet their basic needs. Applications for funding from the Goodwill Fund are accepted June 1 through June 30, 2017. PCDC Public Hearing: Monday, June 26 | 7:00 p.m.
BOT Public Hearing: Monday, July 17 | 7:00 p.m.
On Monday, June 26, the Planning & Community Development Commission will hold a public hearing to consider proposed changes to the Lyons Municipal Code, as it pertains to short-term vacation rentals in residential zoning districts. The intent is to allow short-term vacation rentals as an accessory use. The meeting will begin at 7:00 p.m. in the Lyons Town Hall Board Room. Following the PCDC public hearing, the Board of Trustees will conduct a public hearing on Monday, July 17 at 7:00 p.m. at the above-stated location to elicit public comment concerning the proposed code changes related to short-term rentals. Members of the public are invited to attend either/both public hearings, and may voice public comment at that time, or submit written comments regarding the matter under consideration to Town Clerk, Deb Anthony.